It’s never been faster, easier or simple to find the perfect rug. A lot of people enter a room without looking down at the floor. When there's a custom rug in the room, people pay attention. 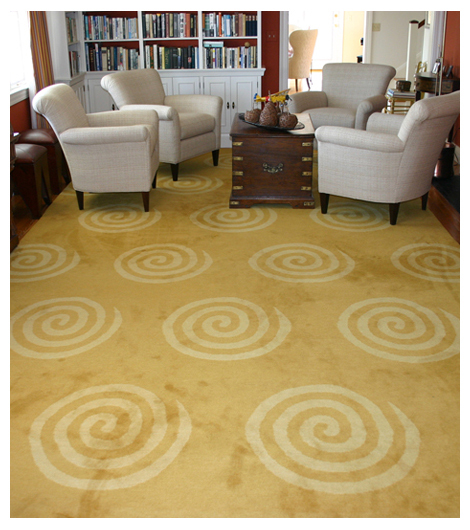 A custom rug gives a room a different focal point. It draws people's attention down instead of just straight ahead. Step 1- Your information: Send us your detailed company information, address and numbers to talk with you. 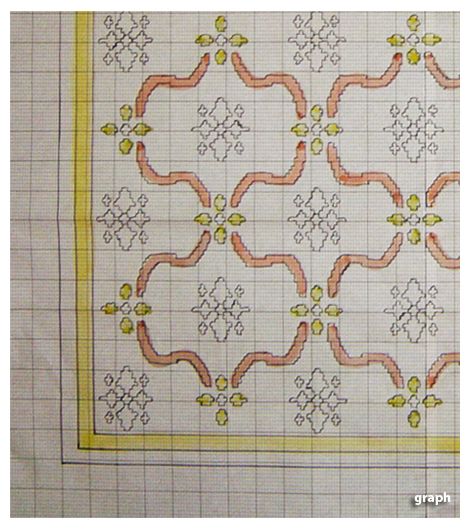 Step 2 – Design: Share us your design ideas, and show us any sketches you've made or patterns you want to emulate. You can also go through our patterns and see if there are any you'd like to have reworked. 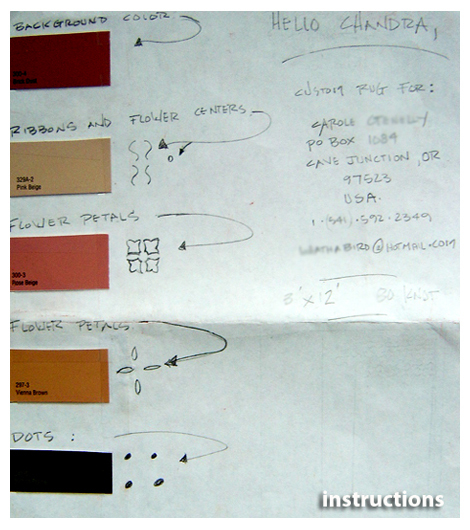 Step 3 – Color: The selection of rug color is a very personal choice. Our custom rug comes in almost every color. You will want to select a color that unites your decorative elements and creates the atmosphere you desire. We are the color experts. We can match any medium for color; fabric, paint chips or any textile you might have as a color reference or you can choose the color from ARS, Pantone Textile color guide, Benjamin Moore color preview and Benjamin Moore color fan. We can create your own unique color and texture. 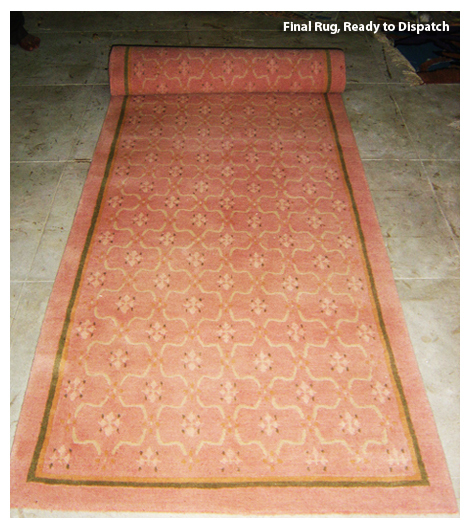 Step 4 – Size and Shape: While standard rugs are available only in limited sizes, our custom rugs allow you to specify the exact size as well as any shape. The right-sized custom rug will anchor the setting. Measure the perimeter of your furniture grouping and deduct 2 feet from the shortest and longest measurement. Your furniture will sit half-on and half-off the rug. When you have a runner created for your hallway, you can leave a foot on each side to show off your hardwood floor. 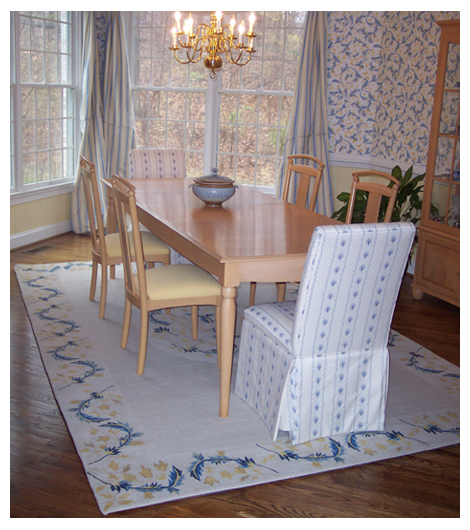 In a dining room, a custom rug can go almost to the wall or it can cover just the center area, extending to where your guests will slide their chairs in and out to sit down for dinner. Step 5 - Verify your order and send it! Once an order is placed, we advise you suitable materials, textures, quality and probably a computer rendered artwork as per your instruction. 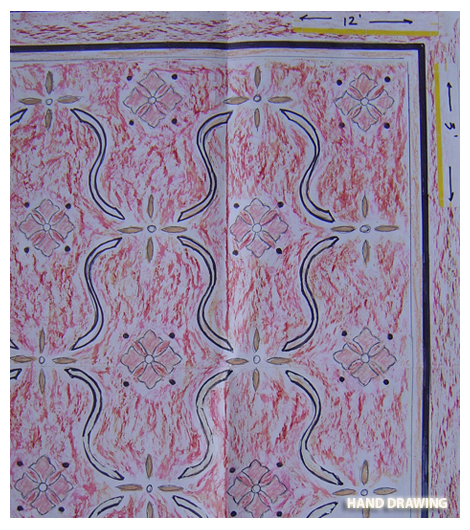 If the artwork satisfies, we can go directly to the final rug production. If any confusions, we produce a small sample in strike off or swatch to test if combined colors chosen compliment each other well. 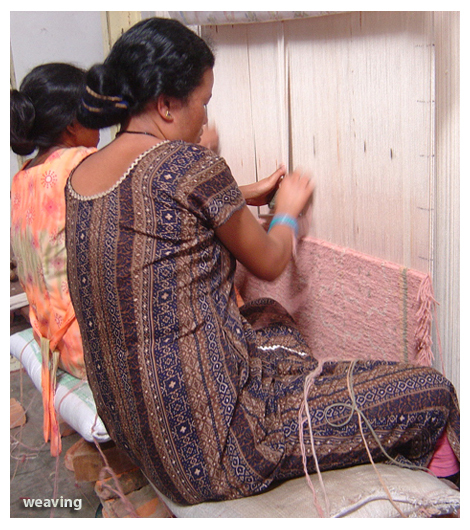 A rug will be made after strike off brings satisfaction to the choice of customer. Copyright © 1997 - 2019 all rights reserved, AMILEE CRAFTS, Kathmandu, Nepal.